If you’re a knitter and you’ve been knitting from patterns for any length of time, you will have run across the advice to knit a test swatch using the yarn and needles intended for your particular project. I cringe at the thought of making test swatches because they feel like a waste of time. Let me get to work on the actual thing I want to make, please! Usually I bypass the swatch and jump right into the project. When I’m finished, I am often annoyed to find that my piece is not the size I hoped it would be. Usually, it is too big. That’s the value of a test swatch in knitting. If I would do them, I would know whether I needed to adjust my needles in order to get the proper gauge. Now that Erik has been seriously refinishing furniture for the past 5+ years, he has come around to learning the value of test swatches in refinishing. Type of wood – Some woods, like walnut, take stain evenly; others, like birch, don’t and will turn out blotchy if not dealt with properly. The stain – Color is a big part of this, but so are the composition (gel vs. dye vs. pigmented vs. wiping & etc.) and brand of stain. How finely a piece is sanded – If coarse-grit sandpaper is used before staining, more pigment will lodge into the wood and the stain will appear darker. The various protective coats – There are usually several layers of protective coats on a given piece. These can include shellac, de-waxed shellac, lacquer, polyurethane (known as “Poly” in the business), vinyl sealer, conversion varnish, and curing oils. The lacquer can be nitrocellulose, pre-catalyzed lacquer, post-catalyzed lacquer, or water-based. The condition a piece is in – If an old piece of furniture has been impregnated with a silicone furniture polish over time, this will contaminate a new finish if it is not properly sealed in. If it has been water-damaged, this damage has to be treated so that a shadow of it doesn’t reappear after the piece has been refinished. 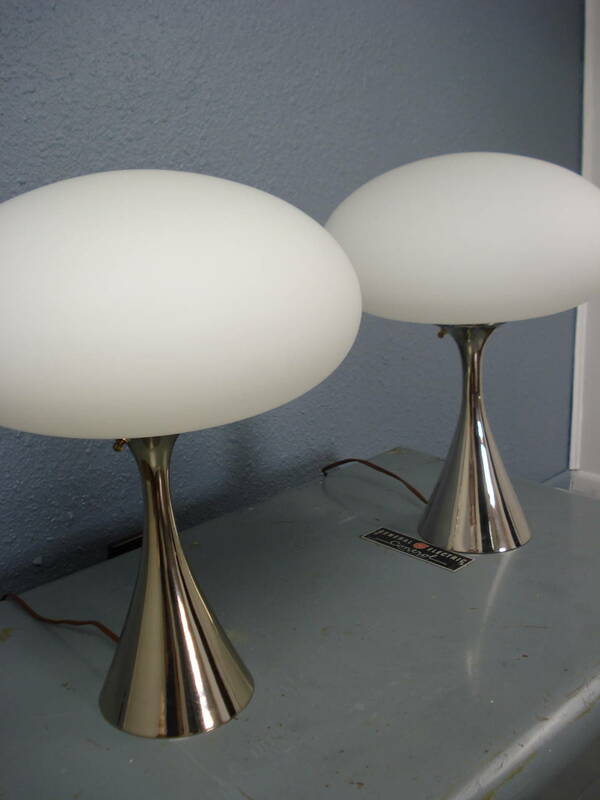 If a piece has faded due to sun damage, this will also affect the final outcome. As you can see, refinishing a piece of furniture is not a simple matter of slapping on a new finish coat. 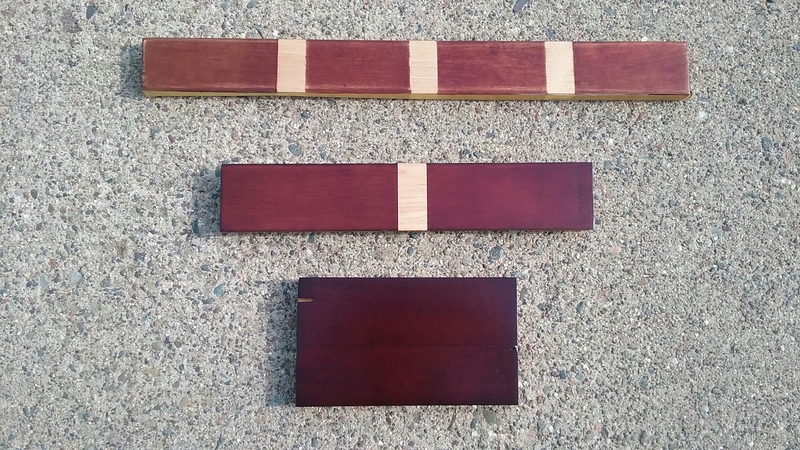 Erik Warner’s refinishing test swatches, May 2017. Because of all these variables (and more!) and the time it takes Erik to strip and sand a piece to bare wood, he has become a fan of test swatches. This is especially true when he’s trying a new finishing technique. He doesn’t want to get to the end of a project and find he doesn’t like the result. That would mean restripping the entire piece over again. 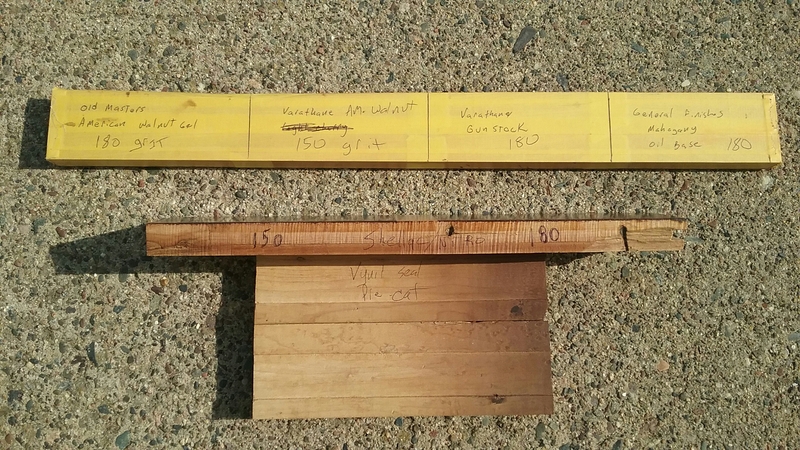 To create a test swatch, he finds a scrap piece of wood that is the same or similar to the furniture he is working on and tries a few finishing techniques on it, marking each trial with the variables so he can remember how to recreate the finish he prefers on the furniture. Notes on Erik Warner’s test swatches, May 2017. 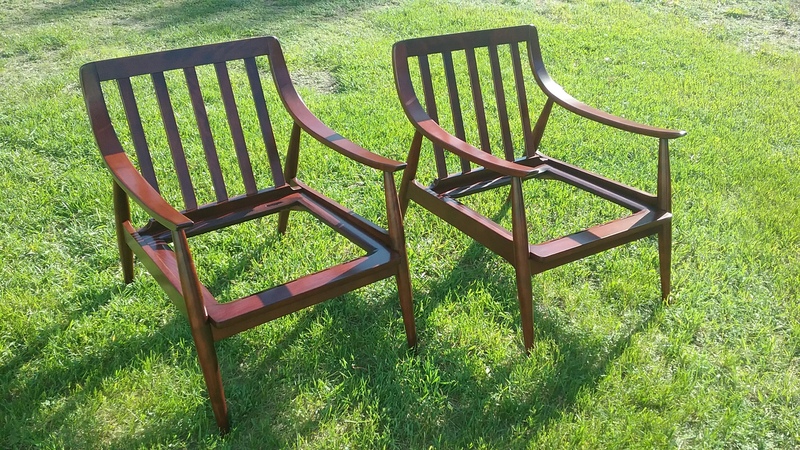 Lounge chairs refinished by Erik Warner, May 2017. Good news! Erik G. Warner Decorative Salvage has a new home (which is why we now feel bona fide) in Little Falls, MN. It’s been a long time coming. We lost the shop space we were renting last November. Erik searched for other rental possibilities but couldn’t find anything appropriate. As winter turned to spring, he started looking for buildings to purchase. This particular one was not yet for sale, but Erik contacted the owners and they said they had been intending to list it. We agreed on a purchase price and had a closing date set in May. Alas! The May date was fouled up by some title issues that took time to work through. We officially closed on the building last Monday. Woohoo! We’ve started on renovations, with Erik and our son Sebastian building shelves to store furniture and spending the entire past week moving accumulated inventory into the space. 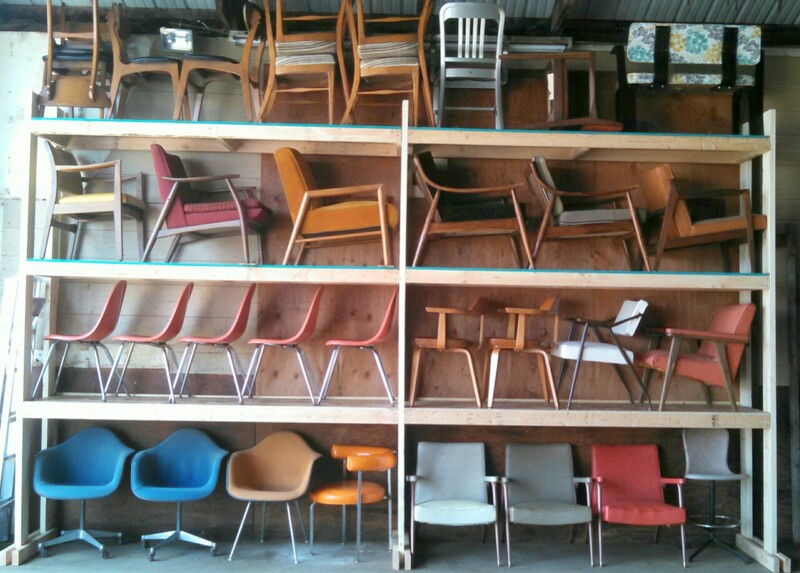 New shelving at EGW Decorative Salvage holding chair inventory, August 2015. Purchasing this shop would not have been possible without the help of Erik’s parents, who provided some capital toward the project, and our credit union, which had faith in our vision. The previous owners, Lynn and Keith, allowed us to use the shop through the summer and paint a room for our photo studio. Thanks to everyone who has assisted us in growing our business.